Childhood gun and shooting accidents are not rare. They are one of the top ten leading causes of accidental death for all age groups outside of newborns and infants. In 2007, there were 122 unintentional firearm deaths in children, and an additional 3,060 nonfatal gun and shooting accidents, which resulted in an estimated 1,375 children needing to be hospitalized for their injuries. Unintentional firearm deaths in children have remained at about the same levels since, with 114 deaths in children and teens less than age 18 in 2010. How many childhood hunting accidents are there? That is hard to say, as there doesn't seem to be a national database with hunting accident statistics. The Hunter Incident Clearinghouse of the International Hunter Education Association, which hasn't been updated recently, reports 27 hunting-related shooting accidents in 2007 in children and teens less than 18 years old. This includes at least one death, a 14-year-old in Georgia who was unintentionally shot in the chest by another 14-year-old (who had completed a hunting education class) while they were hunting squirrels. In 2006, the Hunter Incident Clearinghouse reported 3 deaths and 38 hunting-related shooting accidents in kids and teens. The youngest was just 5-years-old. To get more recent hunting accident statistics, you will likely have to go to each state's wildlife conservation agency and try to find it. The National Shooting Sports Foundation likes to tout hunting accident statistics that rank hunting injuries as somewhere between playing billiards and bowling and much less than playing golf and tennis. To put this kind of thinking into perspective, though, compared to playing golf and tennis, isn't a hunting injury that involves a shooting much more likely to be fatal? And it is these types of hunting-related shooting accidents that people are concerned about. A 10-year-old in Cache County, Utah who died after he was unintentionally shot by a hunting companion who was removing his rifle from the front of a four-wheeler when it fired. Aa 16-year-old from Exeter, California who died while hunting with family and friends after he was unintentionally shot when he wandered in front of the other hunters. A man near Butte, Montana who was in critical condition after he was unintentionally shot in the abdomen by a 13-year-old in his hunting party who was unloading his rifle. Keep in mind that these incidents don't include the perhaps even more common scenario of when a child or teen unintentionally shoots an adult in his hunting party. This happened when a 12-year-old shot a man he was hunting within Iowa when his shotgun accidentally went off. Again, to help prevent these types of hunting accidents, learning about hunting safety and gun safety is important. Takes a formal hunter education class or at the very least, is closely supervised by someone who has taken a hunter education class. Understands shooting safety rules before picking up a gun, especially that he always keeps the safety on until he is ready to shoot, always points the muzzle in a safe direction, and keeps his finger off the trigger until he is ready to fire. Knows to unload firearms when traveling to a shooting area, when climbing a tree or ladder, or jumping a ditch, etc. Knows how to safely carry his firearm, which will hopefully prevent unintentional shootings. Wears blaze orange (hat and vest), so that he can be seen easily by other hunters and doesn't get shot by accident. Understands his safe zone-of-fire and his firearm's range of fire, and knows to always be sure of his target, and what is beyond his target, before firing. Learns to treat all guns as if they were loaded, even if someone has told him it is unloaded. Understands local and state hunting rules and regulations. As with other types of child safety, a layers-of-protection plan is the best way to protect children from hunting accidents. For example, if your child is safely carrying his firearm with the muzzle pointed in a safe direction, the safety on, and his finger off the trigger, then even if he trips while walking, the gun shouldn't fire or hit anyone. 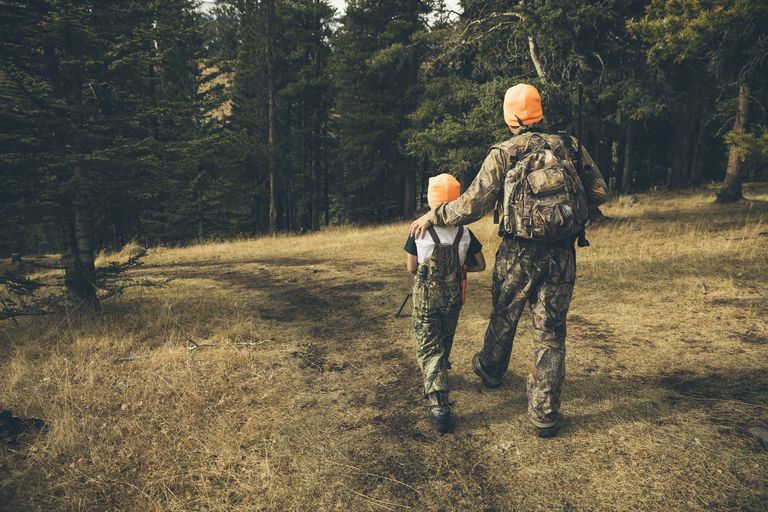 Going hunting with the family is a rite of passage for many kids. Understanding that it can be dangerous doesn't have to mean that you don't do it. It should help you think about the risks and reinforce the importance of hunting safety. International Hunter Education Association. Hunter Incident Clearinghouse. 2007 Incident Summary. National Center for Injury Prevention and Control. WISQARS Nonfatal Injury Reports and Injury Mortality Reports. Study Guide for California Hunter Education Certificate.